How to explore Nazareth, Israel like a local. #MYCITY: LOCALS INTRODUCE THEIR CITY. In today’s MYCITY interview Silke introduces her city Nazareth in Israel. Send me an email when you’d like to present your City. I’m from Germany. 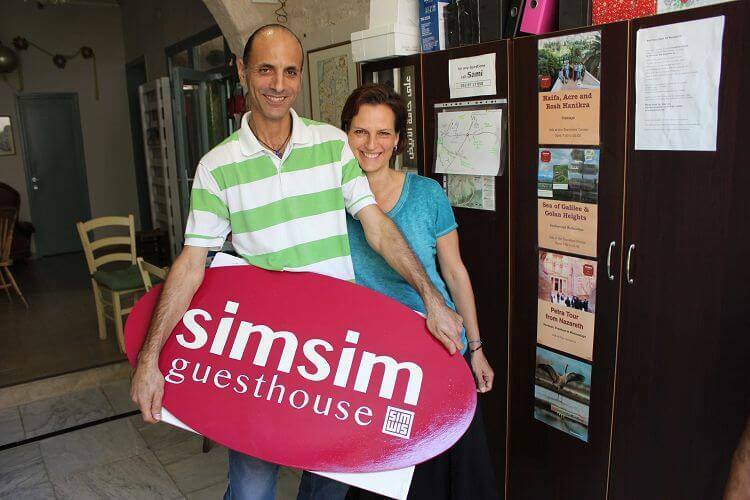 Living and working in Nazareth since 2.5 years with tourists in our simsim guest house and simsim backpackers. Nazareth, the biggest Arabic city in (nowadays) Israel. Nazareth is a hot spot for food in Israel. Many visitors from inside Israel come during the weekend to enjoy the atmosphere and the cuisine – a mixture between local Arabic and Mediteranian food. There is always a movement and new places open. Almost all of them have very high quality of food. Also important is the atmosphere and the situation. Do I want to enjoy my coffee in the sun in the square? Then I’ll go to Bayat. Do I need a cozy place in winter time? I’ll go to Tishreen. Do I want to enjoy a very autenthic place? Then I’ll go Al Reda, but more in summer time with open windows, because it’s a smokers’ place. Do I want to meet a friend to talk privately? Then I’ll go to Rosemary. Of course you can find good fast food also, which is Hummus and Falafel. Falafel Jabali is the oldest and most famous one. Also in the restaurant ‘Diwan al Saraja’ inside the market you can find these small dishes. But this one is very special. The owner Ali Abu Ashraf collects old tools and instruments in his ancient place and he makes “Katayef” – a special desert – it’s quite an experience to sit in or in front of his place with a cup of Arabic coffee and 2 pieces of Katayef! Besides this there are several shops with sweets – different kind of Baklava and …. Knafeh – they sell this directly warm from the tray: goats cheese with a crunchy top – sweet and very delicious. Tabooli (a salad mainly from parsley, bulgur, lemon, salt, olive oil) – so healthy, so good. The bar of the Olga Restaurant. 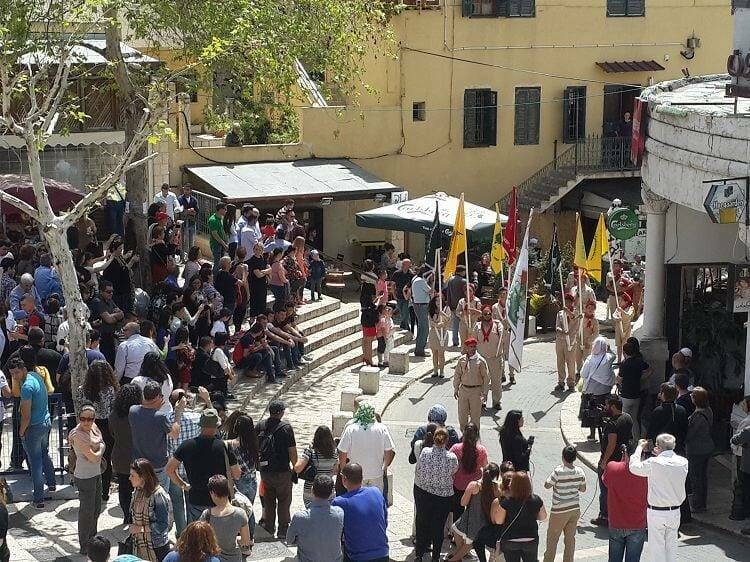 There are no nightclubs, discotheques and real bars in Nazareth, yet. Besides sitting at home, you can find the locals in the restaurants – for food or only for a couple of drinks. There are some exhibitions or concerts – most of them with traditional Arabic music – in changing locations. You just need to know, whom to ask. Nazareth is a holy place. There are several spots related to Christianty. Churches, communities, caves, … Most of these places you can visit for free. The entire old city is an archaeological place. Many houses are still visible from the 1st century, from the crusaders’ period, from the Ottomans. You need a healthy kind of awareness … just as all over the world. Here are no special places, where you shouldn’t go. Inside the city only by walking. In a coffee / bar / restaurant like Kitaabon, Rosemary or Laila. In the roof garden of Mary International Center. On the street, in the workshops (capenter workshops, tailors), in Abu Salem Café (men playing Sheshbesh), in the market, in the restaurants. Ali Abu Ashrafs restaurant “Diwan al Saraja” in the market. The terrace of simsim guesthouse in the old city. The square of the Greek Orthodox Church. 3. Visit the holy places. 4. 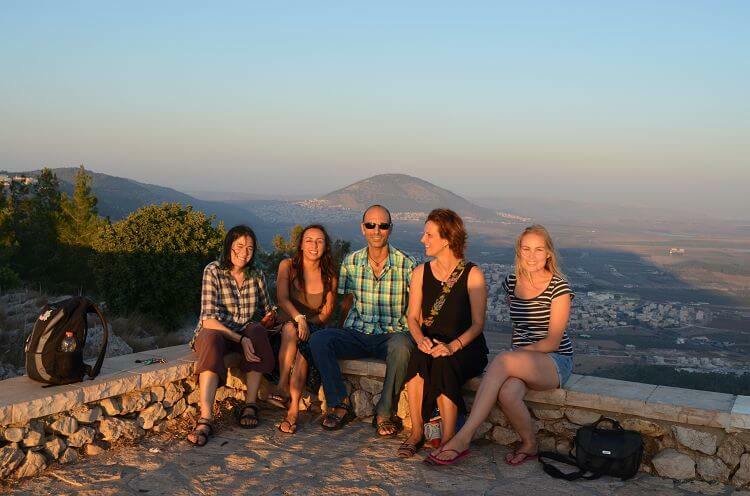 Walk to Mount Precipices and enjoy the view of the city and the Yezreel Valley. 5. Eat hummus and knafeh. One thing you would like to change about Nazareth? We miss a “real” bar with only drinks and good “world”-music. Maybe there will be one the day, when we are going to open one by ourselves – after overcoming several difficulties.